Who are some of the hardest-working hounds in our community? 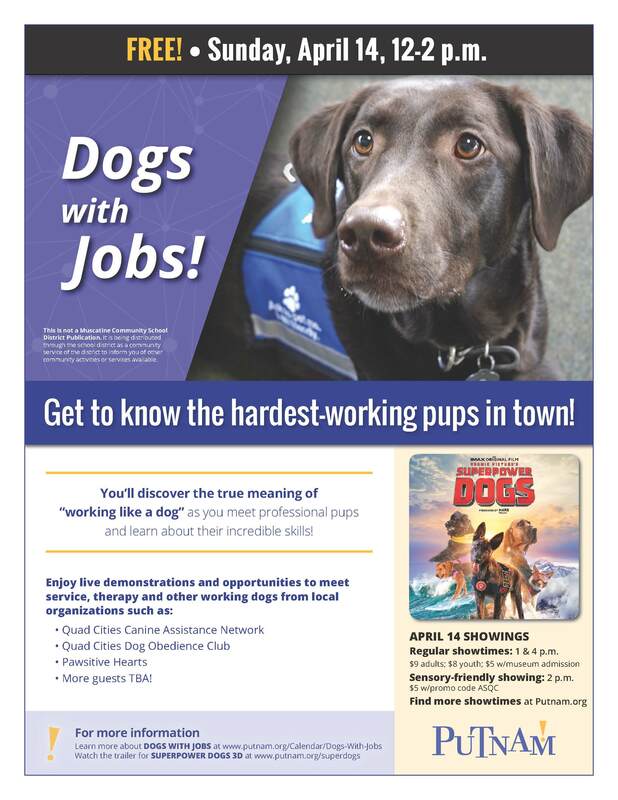 Find out Sunday, April 14, with Dogs With Jobs — for FREE at the Putnam! Discover the true meaning of “working like a dog” as you meet professional pups and learn about their incredible skills between noon and 2 p.m.! The pack includes service and therapy dogs from Quad Cities Canine Assistance Network, Quad Cities Dog Obedience Club and Pawsitive Hearts! You’ll also be able to take in a screening of the Putnam’s must-see, new DOG-umentary — Superpower Dogs — playing throughout the day. Narrated by Chris Evans (Captain America), this movie explores the life-saving superpowers of some of the world’s bravest working dogs who fight crime, help protect endangered species and save lives in the wake of natural disasters. Regular showings will play at 1 and 4 p.m. ($9 adults/$8 youth/$5 with paid museum admission). A special, sensory-friendly screening will play at 2 p.m. for just $5.